Case Type Keep Case (Amaray) DVD Extras: Interactive 3D Animated Video Menus, Live Video Commentary by Ivan Reitman & Harold Ramis, Storyboards, Split-Screen Compare, Production photos, Conceptual drawings, 10 Deleted scenes, 1999 Star featurette, Original 1984 Featurette, DVD-Rom and Web Link, Scene Selections, SFX Team Documentary, SFX Before & After (Multi-Angle), Trailers, Subtitled Production Notes, Digitally Remastered...Atmospheric menus and sub menus! 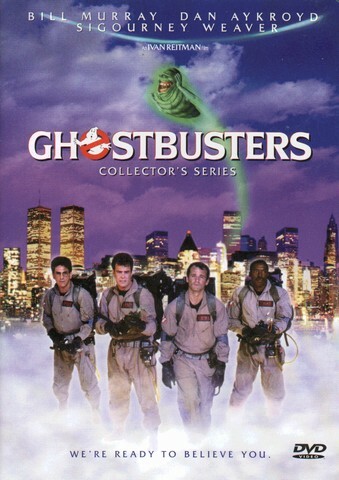 IMDB Rating 7.2 DVD-ROM PC Friendly, Ghostbusters Web site and more. Contains probably the coolest DVD Menus ever. SCIENCE MIXED WITH PARANORMAL FORCES= FUN! I love this movie. Ghostbusters is funny and exciting. The DVD is propped full of extra material to entertain you for hours after the movie ends. The movie itself is restored digitally in both picture and sound, and looks like a brand new movie. The characters and story of ghostbusters is brilliant. Bill Murray is funny, Dan Aykroyd is handy and Harold Ramis is intelligent. Together they are one hell of a combination, so watch out if you`re a ghost. I guess everybody is familiar with the story of Ghostbusters, so if you haven`t bought it yet - what are you waiting for? If you`re feeling bored, don`t know what to do. What are you going to watch? GHOSTBUSTERS!! On the 1-6 scale, i have to land on a 6.